from December 2nd to January 6th 2018. 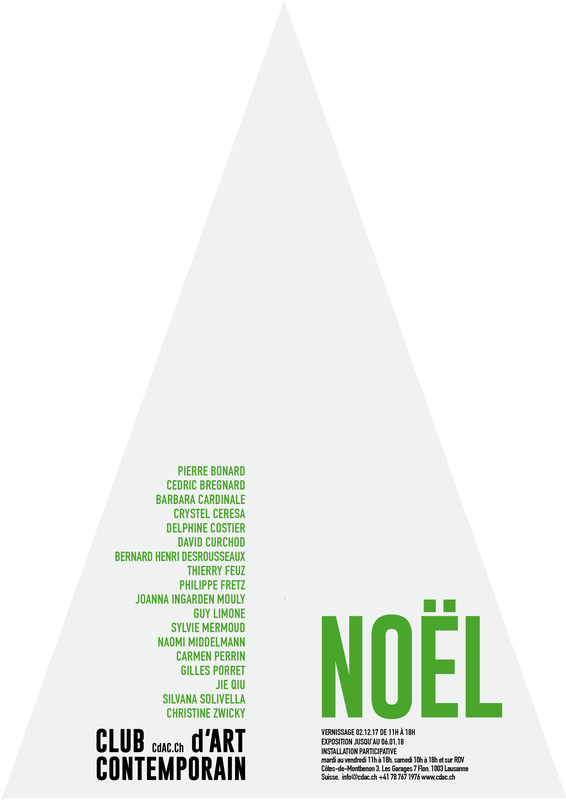 The Contemporary Art Club presents its second group exhibition "Noël"
Pierre Bonard, Cedric Bregnard, Barbara Cardinale, Crystel Ceresa, Delphine Costier, David Curchod, Bernard Henri Desrousseaux, Thierry Feuz, Philippe Fretz, Joanna Ingarden Mouly, Guy Limone, Sylvie Mermoud, Naomi Middelmann, Carmen Perrin, Gilles Porret, Jie Qiu, Silvana Solivella, Christine Zwicky. Twenty artists present various works in an atmosphere of end of year celebrations. In the form of an amateur cabinet, with drawing, painting, object and photography, recalling the friendly and warm aspect of the art collector. At the center, a participative installation allows everyone to express their thoughts and wishes for 2018. They will then be regularly broadcast throughout the year 2018. The CdAC and its artists wish you a happy New Year 2017.